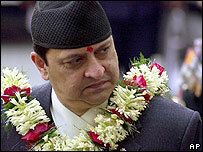 King Gyanendra's message to mark Nepal's Democracy Day on Friday came through loud and clear in the local press. Few newspapers gave the king's comments more exposure than The Rising Nepal, which provided a summary of his message as well as the full text. The same summary also found its way into the pages of the Kantipur daily. Samacharpatra, meanwhile, highlighted the "special situation" since King Gyanendra dismissed the government and declared a state of emergency at the start of February. The king's actions, it said, were for the best. "If we recall His Majesty's respect and commitment expressed in the royal proclamation on 1 February," the paper argued, "then we can assume democracy will never go away." "The difficulties faced by Nepal's free press," it added, "cannot just be ignored." The paper also noted the concern over Nepal aired by British Foreign Secretary Jack Straw. For the Kathmandu Post, the outlook appeared rather bleaker. "There is no denying the fact that... the fundamental rights of the people have been stalled," the paper warned. "There is a possibility of this country falling into an abyss of conflict." The paper's editorial was backed up with a report that leading newspaper editors had joined forces and appealed to the king to "restore press freedoms". Elsewhere in the same edition, the king was said to have assured Amnesty International of his respect for human rights. Meanwhile, reports of planned protests by opposition activists also surfaced, with both Kantipur and the Nepalnews website confirming that police had detained a number of would-be protesters. And the Rajdhani daily said officials from the National Human Rights Commission had been given access for the first time to a number of political leaders kept under house arrest since the king's coup. BBC Monitoring selects and translates news from radio, television, press, news agencies and the Internet from 150 countries in more than 70 languages. It is based in Caversham, UK, and has several bureaus abroad.